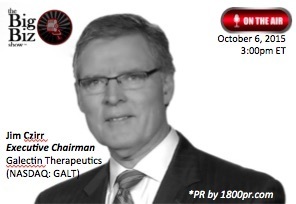 Galectin Therapeutics, Inc. Executive Chairman Jim Czirr to Be Interviewed on "The Big Biz Show"
NORCROSS, GA--(Marketwired - Oct 6, 2015) - Galectin Therapeutics, Inc. (NASDAQ: GALT), the leading developer of therapeutics that target galectin proteins to treat fibrosis and cancer, announced today that Executive Chairman Jim Czirr will be interviewed on "The Big Biz Show" hosted by Bob "Sully" Sullivan. In this exclusive interview, Mr. Czirr will discuss Galectin Therapeutics' progress developing a treatment for the silent epidemic Fatty Liver disease and advanced liver fibrosis and cirrhosis. Listeners will also hear about results that occurred in the most recent clinical trials. The Big Biz Show is a nationally syndicated radio / television program broadcast on 150 stations throughout the country with a weekly reach of 1.7 million listeners reaching over 70 million homes. The Emmy Award-winning show was named by TALKERS Magazine as one of the "Top 10 Most Influential Financial Shows" in the country, and is highly recognized for discussing current business events, internet related issues, and other hot topics in the business world, doing so in an informing, laid back, and humorous manner. Hosts, Bob "Sully" Sullivan and Russ "T Nailz" Stolnack, both are renowned and experienced radio broadcast personalities. The Big Biz Show airs Tuesday through Friday, 12:00 p.m. to 1:00 p.m. PT. Jim Czirr is the Executive Chairman of Galectin Therapeutics, the leading developer of therapeutics that target galectin proteins to treat fibrosis and cancer. Mr. Czirr is a co-founder of 10X Fund, L.P. and is a managing member of 10X Capital Management LLC, the general partner of 10X Fund, L.P. Mr. Czirr was a co-founder of Galectin Therapeutics in July 2000. Mr. Czirr was instrumental in the early stage development of Safe Science Inc., a developer of anticancer drugs. He served from 2005 to 2008 as Chief Executive Officer of Minerva Biotechnologies Corporation, a developer of nano particle bio chips to determine the cause of solid tumors, and was a consultant to Metalline Mining Company Inc., now known as Silver Bull Resources, Inc., (OTCQB: SVBL), a mineral exploration company seeking to become a low cost producer of zinc. Mr. Czirr received a B.B.A. degree from the University of Michigan.